Remodeling your kitchen is one of the best home improvement projects you can undertake. It’s a great way to transform the look and feel of your home, and it also offers an excellent return on your investment if you should ever decide to sell. Unfortunately, kitchen remodels also tend to be among the most expensive home improvements, but that doesn’t mean you can’t get great results while working on a budget. If you’re looking for ways to breathe new life into your kitchen without breaking the bank, here are the essential tips you need to know. For most people, the first step in a kitchen remodel is heading to big-box stores like Lowe’s or Home Depot. There’s nothing wrong with shopping at these chain stores, but you shouldn’t assume they’ll always offer the lowest prices. In many cases, you can find better deals on similar products at local independent stores. Big box stores and national chains, Investopedia1 writes, may offer discounts on some items but tend to price their products to make as much money as possible, meaning everything from lumber to hardware to paint can be a bit overpriced when compared to smaller local shops. If you’re going to remodel your kitchen, you’ll need to scrap those old cabinets and ditch them for a set of brand new ones, right? Not so fast! Although new cabinets give the entire kitchen a fresh new look, they aren’t necessarily worth their cost. New cabinets are the biggest single cost of remodeling a kitchen, and they’re often completely unnecessary. As long as your existing cabinets are still structurally sound and in good shape, you can create an exciting new look for a fraction of the price with a few gallons of fresh paint. Alternatively, if you’re aiming for a more vintage look, you can create a striking appearance for less by painting and distressing your cabinets, then finishing them with some antiquing glaze. Instead of immediately jumping to replace parts of your kitchen, ask yourself whether fresh paint or a new wood stain could do the same job. It’s tempting to splurge on brand new products when you’re doing a remodel, but if you really want to maximize your value, it’s important to do some bargain hunting before you shell out any cash. Habitat for Humanity ReStores often stock like-new products at steep discounts, and many craftsmen, fabricators, and contractor supply stores offer serious savings on remnants and surplus stock. Working with a contractor can also open up opportunities to save money, as they frequently have materials left over from previous jobs that they’ll make available at a fraction of the original cost. While it’s a great idea to keep your existing cabinets if you can, sometimes you simply don’t have a choice but to start anew. If that’s the case, consider replacing your cabinet space with open shelving. Shelves can add visual intrigue to your kitchen space, and it’s also far more affordable than cabinets. You can even boost your savings further by building your own shelves using salvaged wood or painting a few cheap planks. Sometimes all it takes to see your kitchen in a new light is new lighting! Changing the way your kitchen is lit can have a dramatic effect on its overall appearance, and best of all, it’s often a highly affordable and easy change to implement. Recessed lighting is a popular and effective choice, but because it requires additional labor, it can cost more. For a more cost-effective option, consider track lighting. It comes in a dizzying array of shapes, styles, and finishes to fit nearly any decor, and the simple installation process means you can keep your costs down. For a nice finishing touch, add some soft accent lighting underneath your upper cabinets to illuminate your countertops. While it’s exciting to dream up large-scale changes for your kitchen, it’s often the smallest touches that deliver the best bang for your remodeling buck. Customizing your cabinets with some tasteful crown molding or unique handles and drawer pulls are two great ways to create an upscale look without shelling out big bucks for entirely new luxury custom cabinets. Similarly, affixing wainscoting or bead board to the exposed sides of your cabinets or kitchen island can create a striking aesthetic for just a few dollars. As an added bonus, you won’t have to face the mess of any remodeling construction with these small upgrades! 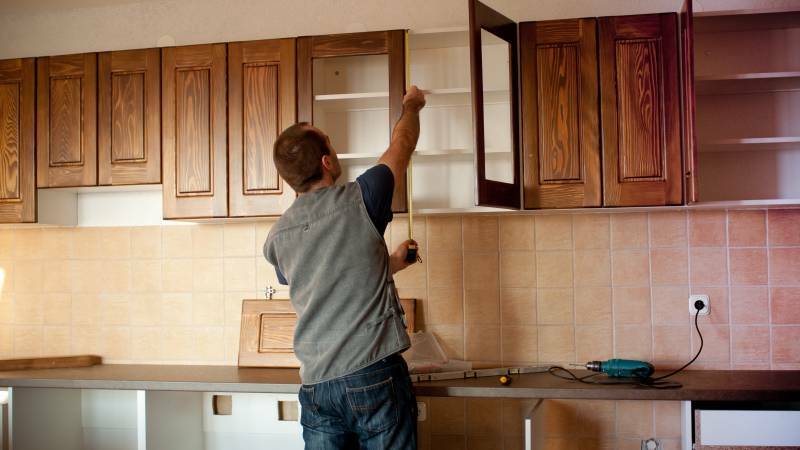 These tips can help you save some serious cash, but completing a kitchen remodel is still an awful lot of work to handle on your own – especially if you don’t have any remodeling experience. To eliminate the headaches that come with a renovation, and to ensure you’re getting the best possible deals on materials and other costs, consider enlisting an inexpensive local contractor’s help. Local contractors have relationships with suppliers that give them access to better prices than the general public, and the savings and peace of mind that come with knowing the job is done right the first time are well worth it. Interested in finding a contractor for your kitchen remodel? Start a search today.